Bring more light into your house, while creating a relaxing green space. 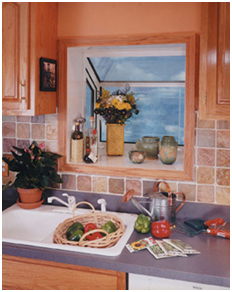 Garden windows are an ideal showcase, adding interest to a kitchen, powder room or any room in your home. Display a prized collection in this glass enclosed curio. For the "green thumb" of the house, what better way to show off gardening talents than with your own private viewing area. Specially designed handles are easy to reach, even above the kitchen sink. You can add a glass shelf for increased display space. With energy-efficient glass from Hansons, your energy savings go further. They also feature “warm-edge” glass that reduces the conduction of outside cold into your home. Be comfortable with the best performing glass you can buy. Fiberglass reinforcing adds strength and durability at crucial stress points and does not conduct heat and cold, keeping you more comfortable in your home. Windows are entirely fusion welded to create a solid, one-piece unit that maintains its strength and durability for years. 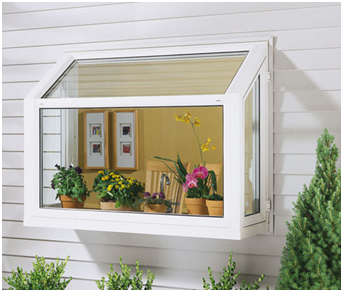 Well-crafted handles allow the Garden window end vents to open effortlessly for ventilation. Uniquely-shaped sash let more light shine through with no horizontal obstructions.